Setting out on a day trip? Then, the waterfalls near Bangalore ought to be on your itinerary. Short drives from the city will get you to the foot of roaring falls that leave you awestruck or gentle cascades where you can dip your feet and take in the scenery. Here’s a list of waterfalls near Bangalore that are less than six hours drive. Popular with the crowds, the falls at Shivanasamudra are out in full force during the rainy months. The twin falls — Gaganachukki and Bharachukki — make for the quite the sight when you view them from the top of the gorge. And you can even splash about in the waters of the Cauvery when you make the steep climb down. The place can get pretty crowded and messy on the weekends so try to make a trip on a quiet day. Located in neighbouring Tamil Nadu, Hogenakkal Falls comes crashing down from a series of rugged, carbonatite rocks that are said to be one of the oldest in South Asia. The waters flow through deep ravines where visitors can take a dip. However, the waters at Hogenakkal can be quite dangerous so ‘safety first’ should be your motto here. While boat rides are restricted to the dry season, you can sample fresh catch that’s fried and sold at the edge of the waterfalls. A short drive from the temple town of Tirupati, Talakona is a relatively untouched piece of paradise. The gentle cascade is nestled in Sri Venkateswara National Park. And is surrounded by lush forests. You can hang out in the lower half of the waterfall, near the clear pool, or if you are feeling more adventurous climb up to the upper portion. The hilly locales of Kemmangundi are home to the Hebbe Falls. At the checkpost, you can hop onto to a jeep that takes you through thick forests and plantations. Then, you trek (for about a kilometre) to the falls. It may seem like a lot of work but those who have been there insist that the sight of the gushing falls make up for the arduous journey. Relatively unknown, Mallali Falls is part of the Kodagu district. This is a great place to escape the crowds and enjoy a slice of serenity. Surrounded by greenery, the falls make for a scenic view. You can even trek down to the bottom of the falls for a splash in the cool waters. Close to the temple town of Tirupati, Kailasakona is a tiny waterfall compared to others on the list. Still, it is worth a visit if you are looking to splash about in clear waters. You can even sign up for an oil massage before you take a dip in the supposed medicinal waters here. For food, you can head to the stalls that are around this place. Nestled in the Koundinya Wildlife Sanctuary, Kaigal (also known locally as Dumukuralla) is only a short drive from Bangalore. It’s a small yet serene waterfall that’s great if you want to spend time dipping your feet in waters and spotting colourful birdlife. However, the falls are pretty cut off from the roads so best if you are here with a bunch of friends and not the kiddies. Right in Bangalore’s backyard, Chunchi Falls is a popular picnic spot and is close to Mekedatu (so you can club the two together). A short trek from the parking lot, at the site, will get you to the waterfalls. And you can spend perch on one of the rocks to take in the scenery. 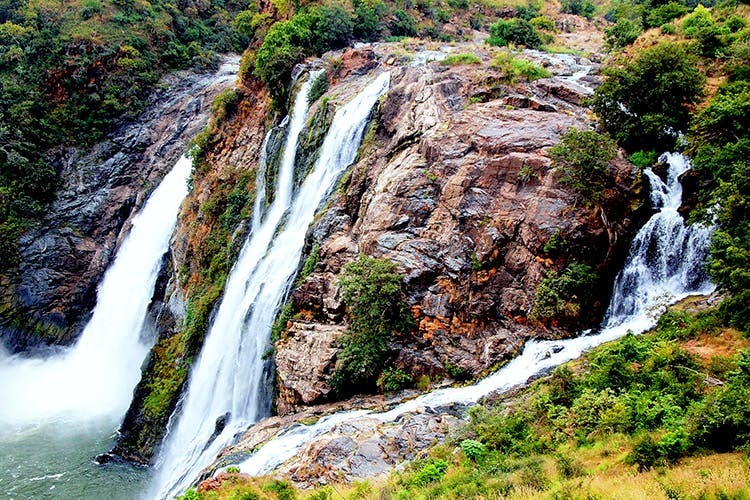 The waterfall closest to the city, Muthyala Maduvu Falls or Pearly Valley is located in Anekal. Since it is so close to the city, expect huge crowds on the weekends. However, if you can manage a trip on the weekdays, this tiny waterfall offers great views. Heading towards Mysore? Then, do drop by Chunchanakatte Falls. Though a small waterfall, the cascade here is worth gawking at during the monsoons. The surrounding greenery too adds to the beauty of the place.